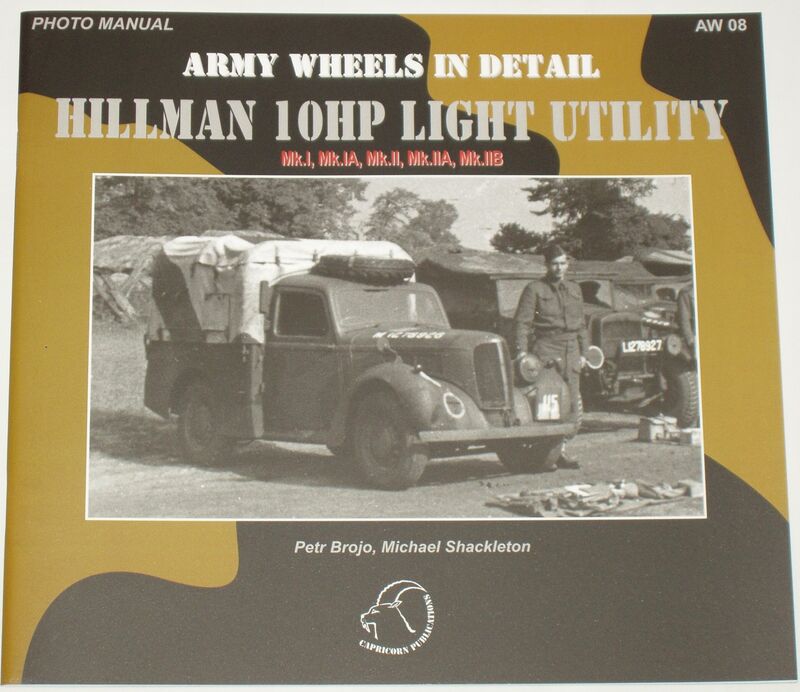 The book is packed full with drawings, schematics, and colour and black and white photographs of the Hillam Light Utility vehicle that was built for the British Army during the Second World War (all explanatory captions are in both English and Czech text). Based upon the Hillman Minx, the car (known as a 'Tilly' as it was a utility vehicle) performed in a variety of roles throughout the war. From the introduction: In 1907, William Hillman and Breton Louis Coatalen laid the foundations of the Hillman Motor Car Company... 1932 saw the introduction of the Hillman Minx. The Hillman Car 4x2 Light Utility Truck (also known as Hillman Tilly, sometimes called Hilly tilly), was basically a military version ofthe Hillman Minx 10 saloon. It shared an identical chassis made of press-formed steel beams welded into a frame which resulted in significant overall and diagonal strength. The chassis was fitted with a pick-up style body featuring a two-seater open rear cabin which extended into a small, tarpaulin-covered cargo compartment. The rear of the cabin was equipped with folding seats. The Hillman Tilly was powered by a 4-cylinder 1184.5 cc in-line side-valve engine which powered the rear axle through a four-speed gearbox. The axles with semi-elliptical leaf springs were fitted with wheels with cable brakes and 6.00-16 tyres (some models were fitted with 5.25-16). Later production models featured a wire mesh engine grille and additional grilles in the engine cowling. The Hillman Car 4x2 Light Utility Truck was produced in the following versions: Mk.l, Mk.IA, Mk.lI, Mk.IIA, Mk.IIB and Mk.lV. The Mk.1 featured the civilian Minx saloon model slatted grille and the bonnet did not have any side cooling openings. The Mk.1 was additionally equipped with an oil-air cleaner, a four-blade thermo­siphon ventilator and cooling system without a water pump. The rear axle was identical to the Minx model. The vehicle was fitted with 5.25-16 tyres. The electrical system was 12V positive earth. Distinctive features of Mk.1 Hillmans were two large, civilian style headlights and four fixtures on the sides of the cargo bed forthe square-section tubular frame forthe tilt cover. The Mk.IA was very similar to the Mk.1 apart from a toolbox situated under the tailgate. Additionally, shaped wooden protection blocks at the corners of the cargo bed for improved protection were introduced. The rear ofthe cargo bed floor featured six (later three) bolting fixtures for a weapon with a stand (Bren gun and seat for anti-aircraft protection though never used in practice). The Mk.II featured two mesh-covered angular cooling openings in the bonnet and a mesh front grille. However, the rest of the body and cargo bed were identical to the Mk.IA with its four square­section tilt frame fixtures. The Mk.IIA was basically a Mk.ll but it now featured the more familiar three till frame fixtures and a single headlight on the left. The Mk.IIB was the primary production type identified by the deletion of electric trafficators and the side lights placed at the top of the front fenders. Several modifications were adopted during the course of production such as removal of hubcaps, wheels with lifting fianges, metal tailgate, and a split driver cab (for easier crated transportation). Mk.III never existed, and Mk.IV was a version for the Ministry of Supply non-military contracts.